ParsonsPaper was a monthly student-produced newspaper that ran from 1976 to 1990, and was sponsored by the Parsons Student Council. The newspaper featured news, opinions, poetry, artwork and photographs contributed by Parsons students, faculty and administrators. As a former Parsons student who went through many sleepless nights accomplishing schoolwork, it sounded incredible that students were able to initiate the newspaper, and then managed to run it. (In fact, there was an article about how sleep was also a rare indulgence for the students at that time.) When I looked into it, it turned out that the students earned course credits–either as an elective workshop or liberal arts credits–for joining the editorial staff. There was also a faculty advisor, Myron Schwartzman, who not only served as a publishing consultant and researcher for ParsonsPaper, but also, importantly and humorously, as “keeper of the flame.” However, in 1990, the Parsons Academic Affairs Committee, citing academic concerns, withdrew the course credit for ParsonsPaper participation. It seems that the newspaper ceased publication following this decision. 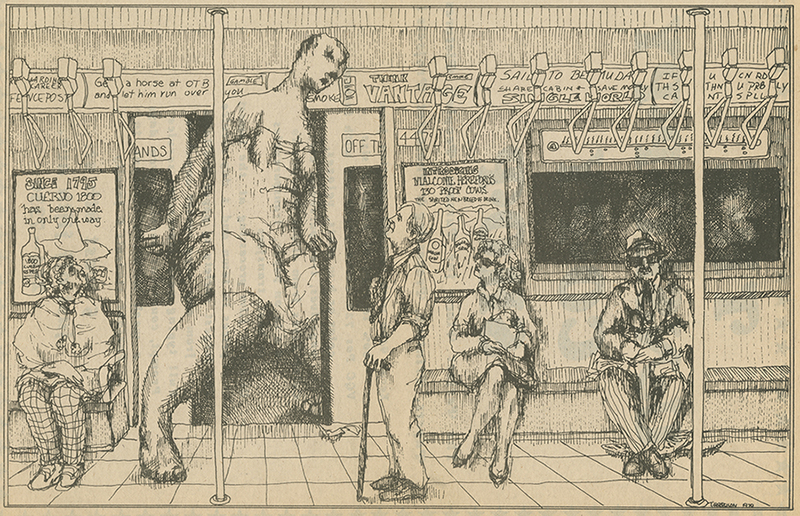 One of the most interesting parts of ParsonsPaper is the student illustrations. 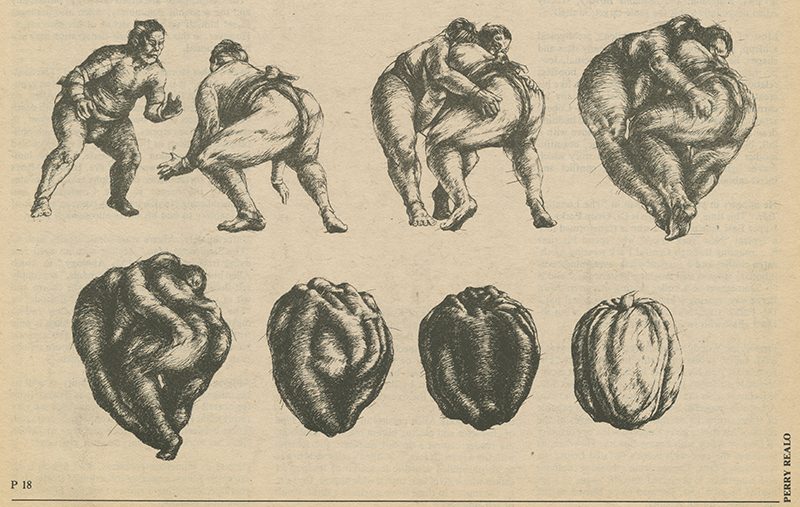 Until the mid-1980s, when more and more photos started appearing in the paper, students’ illustrations were the most prominent images featured in the spreads. 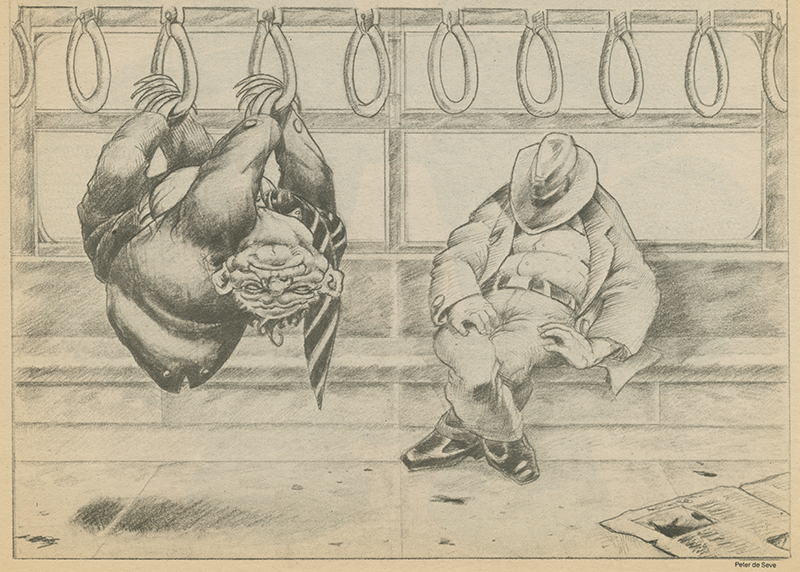 There is an aesthetic that describes the general feeling of the illustrations that appeared before the mid-1980s: they are surreal and gritty, many depicting the illustrators’ imaginations from everyday life experiences. The grittiness is intensified by the use of pen. (Computer graphics weren’t dominating yet!) But even when the illustrations are painted or drawn in pencil, the grittiness is still felt through the content and the stylistic choices students made to depict their subjects. 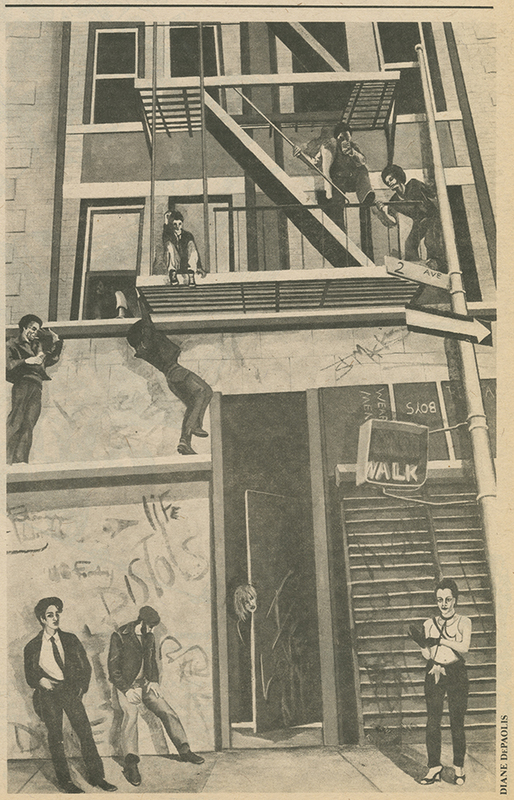 Perhaps these illustrations hint at the sensibility of the New York City the students felt from living in it at the time. Alex Price. Parsonspaper. Parsonspaper Vol. 5, Number 3 (1980 December). Dec 1980.Parsonspaper. New School Archives and Special Collections Digital Archive. Web. 07 May 2015. John White. Parsonspaper. Parsonspaper Vol. 5, Number 3 (1980 December). Dec 1980.Parsonspaper. New School Archives and Special Collections Digital Archive. Web. 07 May 2015. Diane DePaolis. Parsonspaper. Parsonspaper Vol. 5, Number 3 (1980 December). Dec 1980.Parsonspaper. New School Archives and Special Collections Digital Archive. Web. 07 May 2015. Perry Realo. Parsonspaper. Parsonspaper Vol. 5, Number 3 (1980 December). Dec 1980.Parsonspaper. New School Archives and Special Collections Digital Archive. Web. 07 May 2015. Peter de Seve. Parsonspaper. Parsonspaper Volume 3, Number 2 (1978 December). Dec 1978.Parsonspaper. New School Archives and Special Collections Digital Archive. Web. 07 May 2015. Joram Rosov. Parsonspaper. Parsonspaper Volume 3, Number 2 (1978 December). Dec 1978.Parsonspaper. New School Archives and Special Collections Digital Archive. Web. 07 May 2015. 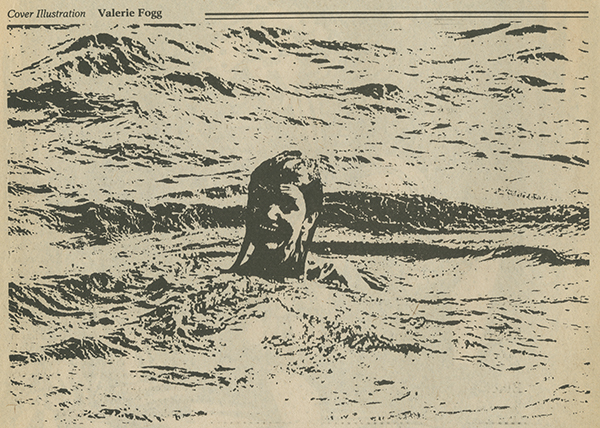 Valerie Fogg, Parsonspaper. Parsonspaper (1982 April). Apr 1982. Parsonspaper. New School Archives and Special Collections Digital Archive. Web. 07 May 2015. William Low. Parsonspaper. Parsonspaper (1980 November). Nov 1980. Parsonspaper. New School Archives and Special Collections Digital Archive. Web. 07 May 2015. Wendy Setzer. Parsonspaper. 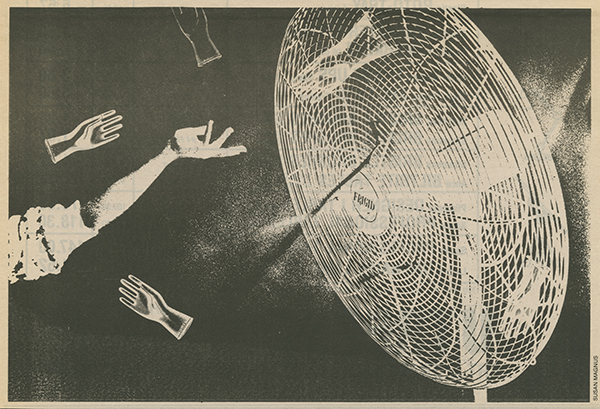 Parsonspaper (1980 November). Nov 1980. Parsonspaper. New School Archives and Special Collections Digital Archive. Web. 07 May 2015. John Hale. Parsonspaper. Parsonspaper Volume 5 Volume 5 (1981 April). 1981.Parsonspaper. New School Archives and Special Collections Digital Archive. Web. 07 May 2015. Susan Magnus. Parsonspaper. 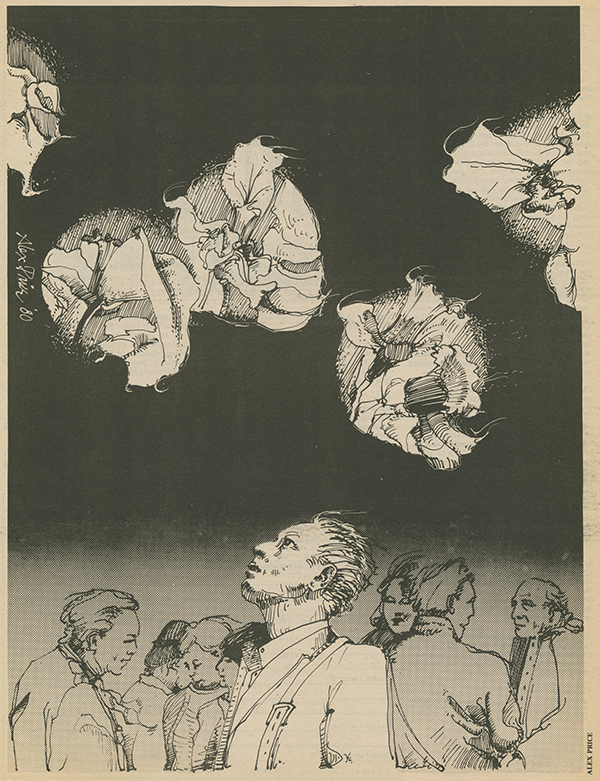 Parsonspaper Volume 5, Number 1 (1980 March). Mar 1980.Parsonspaper. New School Archives and Special Collections Digital Archive. Web. 07 May 2015. Artist Unnamed. Parsonspaper. 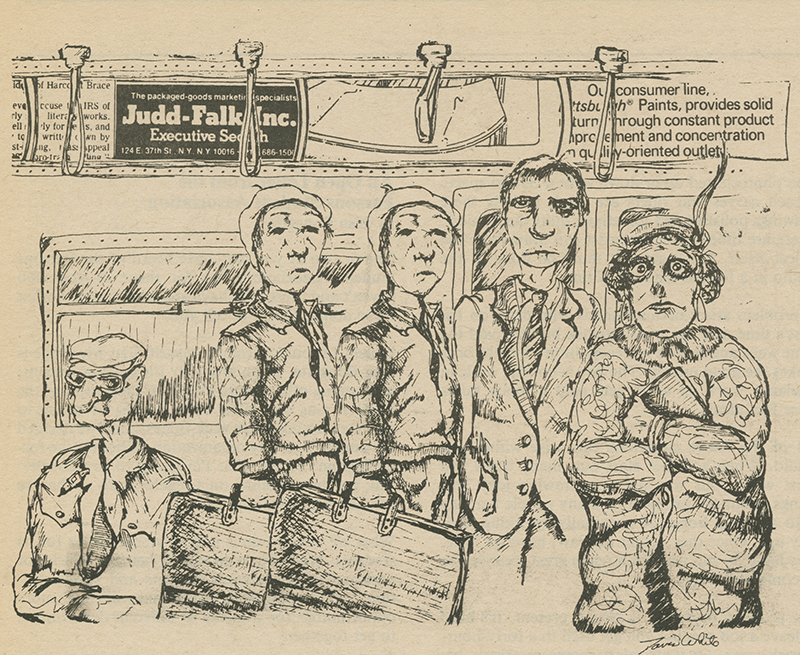 Parsonspaper Volume 3, Number 1 (1978 October). Oct 1978.Parsonspaper. New School Archives and Special Collections Digital Archive. Web. 07 May 2015. Torrelson. Parsonspaper. 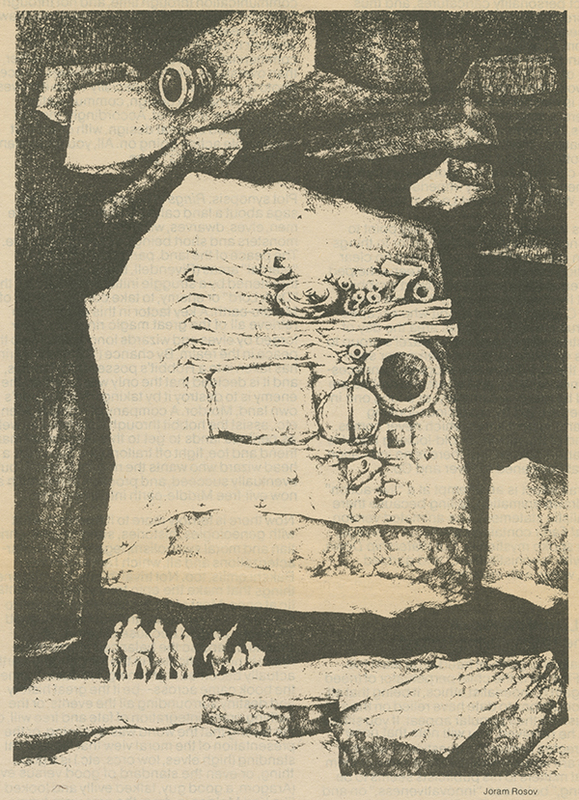 Parsonspaper Volume 4, Number 1 (1979 October). Oct 1979.Parsonspaper. New School Archives and Special Collections Digital Archive. Web. 07 May 2015. Willylo. Parsonspaper. 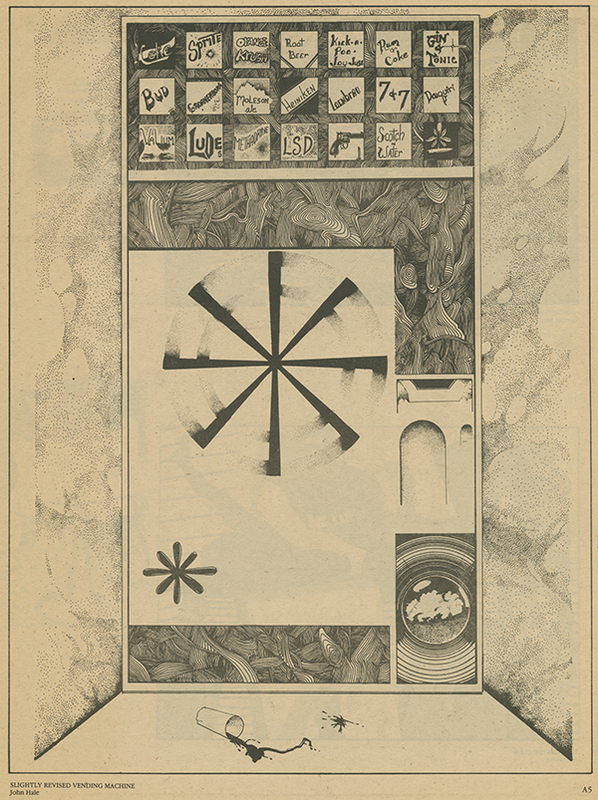 Parsonspaper Volume 5, Number 1 (1980 March). Mar 1980.Parsonspaper. New School Archives and Special Collections Digital Archive. Web. 07 May 2015. 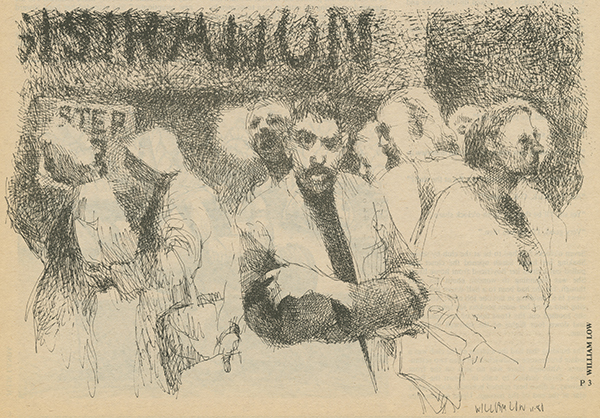 I noticed that these illustrations from ParsonsPaper share a similar imagery with After Hours by Martin Scorsese; the film follows an uptown, white collar office man visiting a mysterious woman in Soho he had just met at a restaurant. 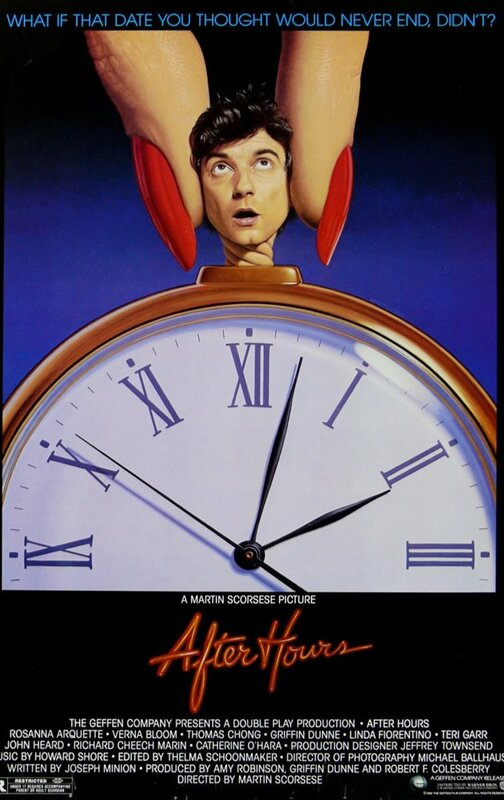 Though not the best of Scorsese, the film does a good job at presenting the downtown gritty New York City in the 80’s from the perspective of a stranger.